Satsuriku no Tenshi has been published in English as Angels of Death by Yen Press since December 19, 2017. This is my first review so don't judge too hard on me. If you like the game danganronpa of the series the hunger games, then this manga is recommended for you. Some might say it's Clichè, but I think otherwise. Without spoiling too much, the plot is about a young girl who wakes up in an unknown hospital. It is then announced that she is the 'sacrifice' to this twisted game. In order for her to escape, she needs to go through all 6 floors, however, in each floor there is a psychopath targetting her. This manga was originally a horror rpg game which then released the manga and is soon releasing an anime adaptation which I cannot wait to see! Over all it's a 9, maybe because I'm biased to horror/ friendship (yes, this manga contains a little bit of friendship) / mystery manga genres. Are you an angel or a sacrifice?... or neither of them? 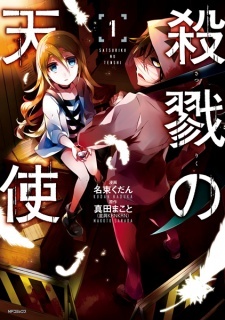 Satsuriku no Tenshi, or Angels of Death in english, started as an horror RPG maker game which was made later on into a manga, and this year, an anime adaptation started airing. The first protagonist is Rachel Gardner, a 13 year old girl who wakes up in a unrecognizable place and only suposebly remembers going to a psychologist appointment after she saw people getting murdered. She decides trying to escape the building but for her surprise that place is not a normal one, each floor has a master that will try to kill her for the simple given reason that she was selected as a sacrifice. Later on, Zack, the first serial killer she encounters and second main protaginist of the story, breaks the place's rules by going to the next floor and attacking its master so he is too selected as a sacrifice along with the girl and they have to work together to escape. At the same time, a strange oath is formed between the two of these two broken individuals. I will NOT give scores for each category as i know i would be biased since i have played the game and have too already grown a huge attachment to it. Pretty great, i'd even call it a masterpiece in my point of view. Does it have flaws? Maybe. But it doesn't make it any more less than it is, this kind of story is one i just cannot simply dislike. It deals with everything i ever could ask for: mental health problems, different point of views towards religion and life aspects actually done well, etc. Please don't think this is just one more edgy and over the top story, because trust me, it is more than that. And without giving spoilers, the ending was the best i have ever seen in fiction, not even joking. You are free to disagree but my mind won't change. The manga art is beautiful, props to the artist. They can make every scene have great impact and the characters expressions are nicely drown, being able to transmit their feelings to the readers. The first thing i have to say is good job adding the side characters backstories. They gave more dept to them while making the readers being more able to understand why they do what they do or what led them to do it in the first place. I'm super happy they expanded Zack's and even showed a little more of it than the game. As for Rachel's only time will tell since the manga has not gotten to that part yet. Aside from backstories, i have to say this: every character has their own points of view and reasons even if what they all do is basically the same at the end: torture and/or kill people. I love seeing each of their mindsets, it's truly interesting if you ask me. After all what i have said what would you expect? A solid 10/10 from me. For the millionth time its called "Angels of Death"